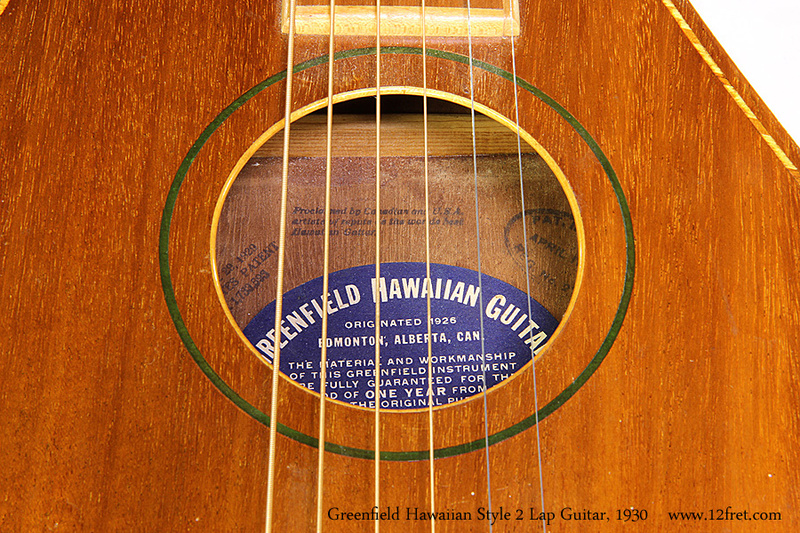 Here’s a wonderful piece of Canadian music history – a very good condition Greenfield Hawaiian Style 2 lap style guitar, built in Edmonton Alberta and dated to April 1930. The Greenfield Brothers operated a cabinetry business in Edmonton. Seeing an opportunity during the heyday of Hawaiian music, the brothers designed and produced a number of very high quality lap style steel guitars. The original Greenfield model was basically a box with strings in the center, which sounded good and was quite loud, but that design doesn’t account for some of the realities of performance, such as tipping the bar for the high string. It was very easy to tap the top with the nose of the bar. 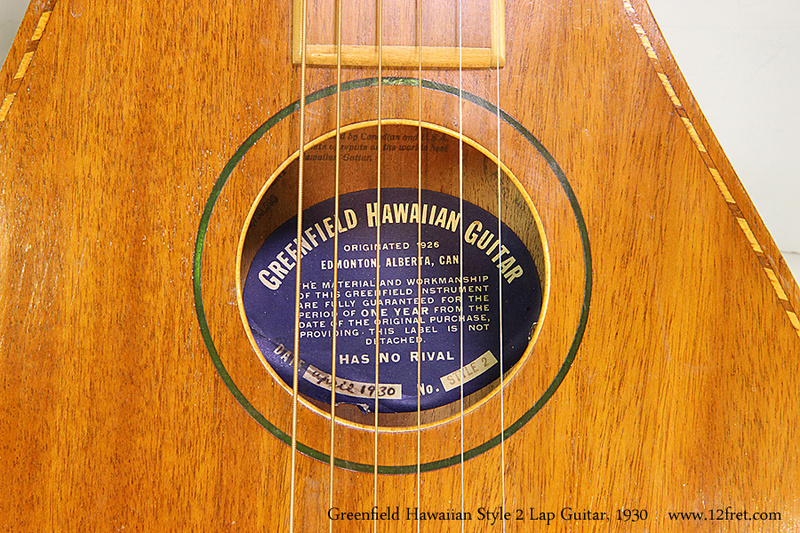 The second Greenfield Hawaiian design was referred to as the ‘Hambone’ and was much shapelier. The treble side follows a more conventional line, and doesn’t extend past the edge of the fingerboard. Problem solved! This design came in two versions, Style One and Style Two, distinguished by the complexity of the purfling. In a key aspect, these designs are similar to the Weissenborn guitars made in the Los Angeles area from the same period. The common element is the hollow, extended width neck, making the entire instrument a resonating chamber. This lovely Style Two example is helpfully dated on the label to April 1930, and in an arc above the label are three ink stamps. The outside two are patent number notifications, and the center stamp is text reading: ‘Proclaimed by Canadian and USA artists of repute as the World’s Best Hawaiian Guitar’. The box is made of Hawaiian Koa, a traditional material for this type of instrument, with the back and sides stained dark. The top is ladder braced with Spruce. The fingerboard is an ‘ebonized’ Maple and the bridge Ebony. Frets are not required on steel guitars, but markers are very helpful, so the fret slots are cut and filled with contrasting veneers. The Maple head is a separate unit, pinned to the end of the box. On some Greenfield versions (but not this one), a patented brace helped support the head. The nut and saddle are bone. This is a very nice piece, fully playable with a warm, rich tone and not too much volume. As the box is braced fairly lightly, and the bridge plate is thin, light strings are recommended.